I love these videos of pro athletes dressing up as older people. Whether it’s a skater, weight lifter or pro ball player like this video, they always crack me up. Watch “gramps” put on a clinic at the park. The lads from Good Mythical Morning ask the age old? question “will it snowcone?” And try to put everything from Reeses peanut butter cups to sushi in a snow cone. I’m glad we’ve got them to try these things for us. 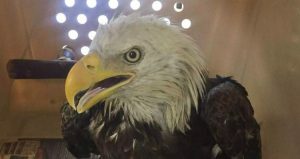 I love animals and I love this great country so what could be better than a story about a bald eagle making a valiant recovery? Here’s the original article about this great bird.